From Main body of report: There was one fatal accident by an explosion of fire-damp, that of a man who died a few days after he was burned by an explosion of gas at Cornsilloch Colliery, Hamilton, in March last. He was working in a bratticed place, and was re-entering his place, after fifteen minutes absence, with his naked light, and ignited some gas which had accumulated during his absence. The pit had newly reached the coal, the door stoop was not turned, and the ventilating arrangements were only temporary. From Main body of report: In this case there were two seams of coal being worked at different levels. The deceased was a roadsman and general assistant, and had occasion to visit both seams. It appears that on the morning of the accident he, along with the manager, had been "signalled away" upon the cage from the lower seam. It was the intention of the deceased to go off at the upper seam, but from some cause the cage was not stopped at it. The bottomer at the upper seam, on being called upon to signal back the cage to that level, did so, and it was lowered accordingly. At this point some unfortunate misunderstanding as to signals took place, and the engine-man, instead of allowing the cage to remain steadily at the upper seam, raised it while the deceased was in the act of getting off. He was caught between the cage and the side of the shaft, and, after being dragged up a certain distance, fell away from the manager, who had partly a hold of him, to the bottom of the shaft. From Main body of report: On the day of the accident the "signal wire" in the shaft had broken, near to the connexion formed with the signal hammer at the surface, and the deceased, who was one of the underground assistants, repaired it. I understand that after the repair had been made, the pit had not been worked more than an hour, when the wire broke a second time. The deceased and a neighbouring workman, for the purpose of again repairing the wire, had gone on to the cage, and were in the act of being drawn up when the broken wire, hanging partially loose in the shaft, got entangled with the cage, and in some way coiling round the deceased, he was drawn off the cage, and fell down the shaft a distance of 50 feet or thereby. It was an overlook on the part of the deceased to attempt to go up the division of the shaft where the wire was hanging loose and broken, without first communicating with the engineman as to the state of things, so that he might have raised the cage slowly, and taken all necessary precautions. 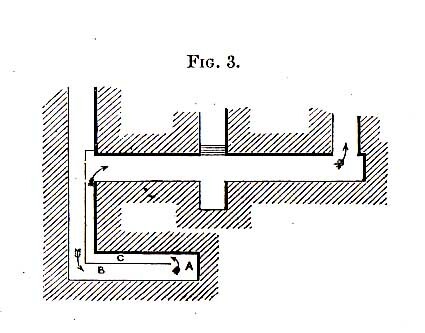 From Main body of report: It is difficult to understand how this accident happened, and as no one saw the deceased fall into the shaft, it can only be conjectured that, as his oil pourie was found close to him at the pit bottom, he had gone near to the shaft for the purpose of oiling some of the parts of the machinery, and either overbalanced, or in some way fallen in. The parts of the machinery near to the shaft, and occasionally requiring a little attention, were ill situated for getting at, and the deceased, who had long acted as engine-man, and was advanced in years, had probably exposed himself rather more than was really necessary. Apparently the gas had been forced out upon the deceased's lamp ; it may have been by a fall of roof beyond the possible range of the fireman's inspection, but the ventilation at that particular place was weak and barely sufficient to cope with any unusual discharge of gas. This points to the necessity for the strict use of safety lamps while taking out pillars, if gas is suspected to exist. From Main body of report: In this case the deceased acted as fireman, and was otherwise engaged assisting in the management of the pit. It appears that one of the working places, A, fig. 3, near to the extreme of one of the sections of work, had been abandoned for some time. The brattice by which the air was guided into it was not quite up to the face, consequently the air did not pass farther than the end of the brattice, or about 30 feet from the face of the coal. Between the end of the brattice and the coal a small quantity of gas had accumulated. I understand that on the day of the accident the deceased and an assistant had gone into the place A for the purpose of extending the brattice, to clear out the gas, and getting it put into working order. They had extended the brattice 12 feet, or to within 18 feet of the coal face; they had used safety lamps to work with, but kept their open lights back, as at B, about 38 feet from the face. It is understood that at the time of the accident the assistant had gone from the face to where the open lights were placed with the safety lamp for the purpose of trimming it, and during his absence the deceased had commenced to " waff" or displace the gas beyond the brattice, when either by passing back the " intake" to B, or along the return towards C, and finding an opening through the imperfect brattice, it ignited at the open lights at B. There was a slight explosion, by which they were both burned, and the deceased shortly after died from the effects of the injuries. This description of accident should never happen. Under the circumstances it was absurd to allow open lights to be near to the gas, although the quantity was small, while in the act of displacing it; and it is difficult to conceive how a steady careful man, such as the deceased is reported to have been, should have acted so inconsiderately. From Main body of report: The deceased was a young man and assistant pit-headman, and at the time of the accident he was engaged emptying a water chest, and returning with it to be placed upon the cage, when he fell into the shaft and was fatally injured. 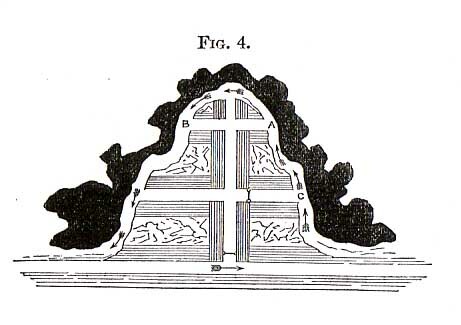 If self-acting moveable fences, such as are in use at the majority of pits, had been in operation this unfortunate accident could not have happened. From Main body of report: The deceased was night fireman, and on the evening of the accident, before allowing the workmen to descend to their work, he in making his examination discovered that the ventilation was defective. He dismissed the workmen on account of the pit not being in a fit state for persons to work in, but after a few hours he again descended with an open light for the purpose of making a farther examination when, as reported, a quantity of fire-damp was ignited at his unprotected light near to the pit bottom. Owing to the situation of the "waste" of this pit, it is difficult to comprehend how an explosion of firedamp could happen at the pit-bottom without being much more destructive than the one in question. And no doubt a flask of gunpowder had been exploded in addition to any other explosion, which of itself might possibly have accounted for the accident. There was something painful about this occurrence, the poor fellow, on account of a derangement of the "slides" in the shaft, having to lie a considerable time at the bottom of the pit before he could be got up. He lived a few weeks after the accident, but died from the effects of the injuries. From Main body of report: The unfortunate sufferer in this case was a young lad who worked with a collier in the "main" seam. It appears to have been arranged with the oversman that they should change their place of work from the main to the " ell" coal, and they had their choice of the walls A, B, fig. 4. I understand that on the morning of the accident the deceased had gone into the "ell" coal, as explained by the person with whom he worked, for the purpose of examining the roads leading into the walls A and B, to find out which of them would be the most suitable for "drawing" upon, and while in the act of going into the wall-face A, a quantity of firedamp was ignited at his lamp, and by which he and the person who was working in the wall C were seriously injured. In this case the fireman had wilfully neglected to examine the colliery before allowing the workmen to enter to their work. He was charged by the Procurators Fiscal, Messrs. Hart and Gemmell, with culpable homicide, also culpable neglect of duty, and tried by the sheriff of Lanark and a jury. He was found guilty of culpable neglect of duty, (the charge of culpable homicide was not proven,) and sentenced to one month's imprisonment or pay a fine of £10.